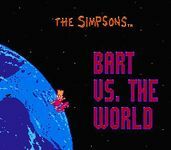 Bart Simpson has won a round-the-world scavenger hunt on the Krusty the Clown show. However, the contest has been rigged by Mr. Smithers in order for Mr. Burns to rid himself of the Simpson family for all the trouble they've caused him over the years (a stark departure from the show, where Burns often has trouble remembering who the Simpsons even are) by sending his agents and fellow family members to take care of them during the trip. Bart travels through various real-world locations collecting items, with occasional cameos from the other Simpsons family members. Source: Wikipedia, "The Simpsons: Bart vs. The World", available under the CC-BY-SA License.